Kate Hartwell, NHCM, CPM. Kate's training was almost exclusively apprentice-model care, which is a valuable, traditional path to licensure where the student is immersed in hands-on practice under senior midwives. 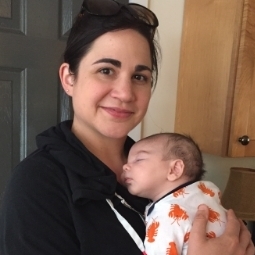 She has been attending births since 2007 and she has attended many births in diverse settings – home, birth center and hospital – working with various NH, ME and VT midwives. Kate is a contemporary midwife offering the current recommended standards of practice, testing, and procedures, while upholding the traditional midwifery model of care. Pregnancy and birth is statistically low-risk and requires little or no medical intervention, and Kate is skilled at recognizing when intervention is necessary. The safe passage of mother and baby is of paramount importance. Kate offers much time and attention to ask questions and discuss concerns during clinic and home visits. Her emphasis is on educating, identifying and preventing problems, allowing families to make their own informed decisions regarding care.